Some useful security-related topics today. Be prepared to ask questions about Assignment 7, if you have any. Notice: In the “Specifications overview…” section, there was an unintended contradiction. It has been corrected. Briefly, you are asked to enable “add new” use case for Artist and Album objects, and optionally, enable “edit existing” and “delete item” use cases for the Track object. We will cover some useful security-related topics that will help you build better web apps. We start with a general user interface topic – menu-building – and then move on to security topics. We start with this topic, because we use it again soon, when we discuss security topics. The Bootstrap framework enables you to predictably and easily create a dropdown menu. The technique is fully described in the Bootstrap documentation on “Dropdowns“. Here’s what it looks like as an image from the code editor. Click the image to open it full-size in a new tab/window. There’s a range of security topics that we’ll touch on today. While studying this section, open the ConditionalMenus code example. Open the Manager.cs source code file. Near the bottom, it has a new class named UserAccount. This class will make it far easier to expose often-used data in a user account. Sometimes you need the data to make a decision (e.g. does the user have the “Admin” role claim? ), and sometimes you need the data for the user interface (e.g. the given name(s) and surname). Again, this class just makes it easier to get to often-used data. It is a convenience class. In the Manager constructor, it creates one of these UserAccount objects, and exposes it as a public property. As the code comments state, you can use this property in the Manager class methods to control logic and flow, and to use its data/string content. As you know, the _Layout.cshtml asset is used to render the default layout for views in your app. It includes a menu. The Bootstrap framework defines its appearance and behaviour. We can add conditional menu choices to this menu. What condition? Anything you can imagine. A popular condition is “security”. In other words, if a user is authenticated, or authenticated and has a specific role claim, you may want to show one or more menu items. Above, you just learned about the new UserAccount object that you can configure in a view. Its properties (and methods) can be used to make decisions about what to render, and its appearance. For example, you can render a menu item if the request is authenticated. You can use Request.IsAuthenticated, or userAccount.IsAuthenticated. Either one is acceptable. 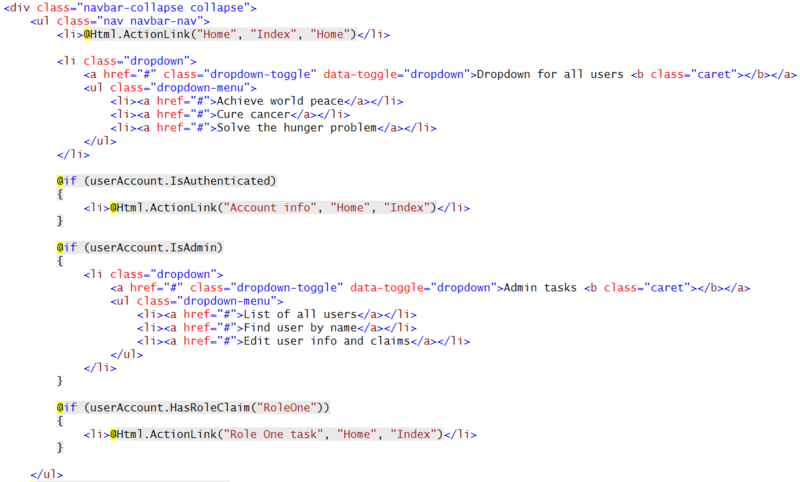 You can also render a menu item (or a full dropdown menu) if the authenticated user has the “Admin” role claim. Finally, you can render a menu item based on any other logic or condition. You can even render strings from the userAccount object in the menu itself. Here’s an image from the code editor that combines all these ideas. Click the image to open it full-size in a new tab/window. When your teacher team introduced the ASP.NET Identity system, we explained that it did not include a ready-to-use tool to, for example, manage user accounts. Open the ManageUserAccounts code example, and study it as you read this section. In the past, while you studied the Account and Manage controllers, you probably noticed the UserManager object. It is part of the in-memory security components, while your app is running. …and many other members to help you work with your app’s users. The code example includes an AccountManager controller, and some views. (FYI – These will appear in a future version of the project template.) Run the app, create some users, and use the account management features. Study the code. This is a common scenario, in all web apps (and web services): Restrict viewing and editing to the owner of an object. Study the NotesApp code example while you read this section. Almost all web apps enable users to work with public data, and data that is private to that user. This extends to any app that uses the web as a way to deliver data, for example, all the mobile apps that you use (Messages, Mail, Instagram, Facebook, etc.). The methods in the Manager class are the key to implementing this behaviour. The value of the Owner property is set when the object is created. Controller code is unchanged from previous web apps. This new functionality is implemented in the Manager class only.